FOOTBALL Our football team has had a triumphant season. Not only were they league winners, but they also won the Falkingham Cup, beating Ninelands Primary in the final. They finished the season on a real high last week winning 1-0 against Holy Family School. The extra time winning goal scored by Thomas Harris secured their victory. Their third trophy means they are the best year 6 football team in Leeds. An amazing achievement! They play lovely passing football, but perhaps their finest qualities are how they communicate with, and support, each other. Individually and collectively, a great team. July 2018 - Congratulations to everyone. 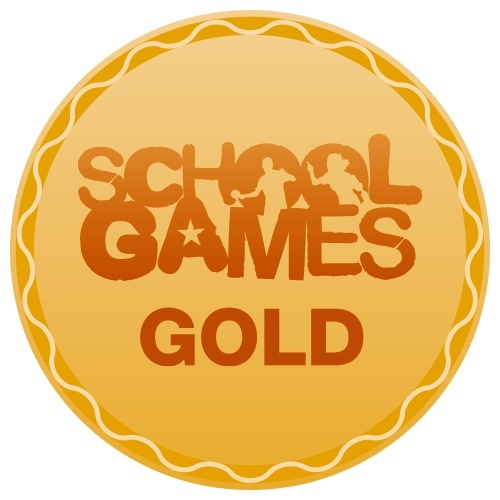 We have been awarded the School Games gold Award for a third year in a row in recognition of all our participation in competitions and our extra curricular provision. July 2017 - Congratulations to everyone. We have been awarded the School Games gold Award in recognition of all our participation in competitions and our extra curricular provision. Wow what an amazing sporting year we have had with six trophies to show off. 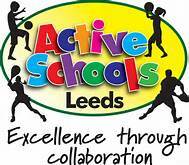 Our Year 4 girls won the Leeds Cross Country Competition, Our Year 6 girls football team were runners up in this year's Leeds City Football Tournament. 54 teams took part and it was a nail biting final. Our Year 5 rugby team won this year's under tens rugby league Burton Cup final. Our Year 6 rugby team then won the Burton Cup final for the under elevens! A Highfield double and the first time we have won the trophy since 1966. July 2016 - Congratulations to everyone. We have been awarded the School Games gold Award in recognition of all our participation in competitions and our extra curricular provision. PE and Sport play a very important part in the life of Highfield School and two, hour sessions per week, are dedicated to physical activity in the curriculum. We believe that physical education and sport contribute to the holistic development of young people and through participation in sport and physical education, young people learn more about key values such as teamwork, fair play and respect for themselves and others. At Key Stage one children experience dance, games, athletics and gymnastics. At Key Stage two in addition to those taught earlier, pupils also have lessons in swimming and outdoor/adventurous activities. For the whole of Year 4 children attend weekly swimming lessons where they are taught by trained instructors. The programme includes water confidence, safety and stroke technique. In gymnastics children use the large apparatus which enables them to develop their gross motor skills (climbing, jumping, balance etc). Games lessons involving the use of small apparatus (bats, balls, skipping ropes etc) develop the children's fine motor skills, such as catching, throwing and hand/eye co-ordination. A wide variety of sports and team games are taught allowing children to apply the basic skills of attacking and defending in competitive games. Dance is often taught with a cross curricular approach and has a high profile in annual year group performances giving children opportunities to perform their movement patterns and compositions. External coaches have also been used to support the teaching and learning of sports such as basketball, cricket and golf. During years 4 and 6 children also participate in extensive outdoor/adventurous activities as part of the residential trips toRobinHoodsBayand Marrick Priory. As a school we participate in many inter school sporting competitions and festivals including swimming, gymnastics, football, netball, cross country, rounders and tennis. The school also runs a wide variety of afterschool sports clubs, some of which are led by teachers and coaches from local clubs. These include football, gymnastics, netball, dance, basketball and Tae Kwando.